MODERATOR: Ladies and gentlemen, thank you for being here. General Chang and Secretary Hagel have just completed their talks and it is our great honor to have them with us and to take your questions. First of all, I would like to give the floor to General Chang. 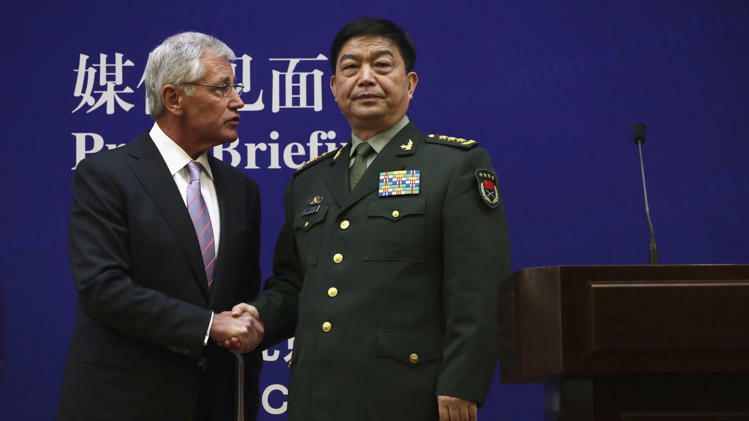 MINISTER OF DEFENSE CHANG WANQUAN (THROUGH TRANSLATOR): Dear friends from press, upon my invitation, U.S. Secretary of Defense Chuck Hagel is visiting China from April the 4th through the 10th. This is the reciprocal arrangement to my visit to the U.S. last August. It is also Secretary Hagel’s first visit to China since he took office. The Chinese side takes Secretary Hagel’s visit seriously and have made a thoughtful preparation and arrangements. First, high-level meeting is arranged in his program. Second, we arranged a visit to the carrier for Secretary Hagel, making him the first foreign military leader to be onboard of Chinese aircraft carrier. Third, on Secretary Hagel’s request, we will arrange a visit to the non-commissioned officers’ school where Secretary Hagel will talk with the students, face to face, have lunch together and relieve his moments as an NCO. Here he will have reached a colorful schedule with those NCO students. Just now, Secretary Hagel and I had a small scale and large scale discussions. The two sides exchanged ideas on state-to-state and military-to-military relations. International and regional issues, and the topics of common interest, in a candid, friendly and a constructive environment. Together we have made a positive achievement and important consensus. First, both sides agreed to seriously implement the important consensus reached between President Xi Jinping and President Obama on developing China-U.S. state-to-state and military-to-military relations, and work together to push forward the sound and the state of development of the new model of China-U.S. military-to-military relationship. Second, both sides agreed to positively advance the process of establishing a military notification mechanism of major military activities and to the standards of behavior for air and sea military safety on high seas, in an effort to make substantive progress at an early stage. Third, both sides positively evaluate the good momentum of current development of China-U.S. mil-to-mil relations. Both sides agree to further strengthen exchanges and constantly expand areas for practical cooperation. Both sides agree to establish an institutional army-to-army dialogue for exchanges and cooperation and promote the army-to-army cooperation in an orderly way. Fourth, both sides believe that international terrorism is the common challenge to peace and stability in the region and globally. Both sides discussed related cooperation in the area of counterterrorism. Fifth, both sides affirm to further strengthen cooperation on international and regional issues in order to achieve positive interaction in Asia-Pacific region, working together to maintain peace and stability in Asia-Pacific region. Sixth, both sides agree to convene, within this year, an Asia-Pacific security dialogue to further exchange ideas on military-to-military relations and issues of common interest. Seventh, both sides agreed to conduct land-based joint medical cooperative exercise after Rim Pacific 2014. We look forward to a successful visit by Secretary Hagel through joint efforts from both sides. And I stand ready to work with Secretary Hagel on the basis of the consensus between the two sides to steadily promote the development of the new model of China-U.S. military-to-military relations. Thank you. MODERATOR: Thank you General Chang. Now the floor turns to Secretary Hagel. Secretary, please. SECRETARY OF DEFENSE CHUCK HAGEL: Thank you. General Chang, thank you. And thank you for extending this invitation to visit to China. I know how much effort and hard work has gone into organizing my trip and I am very grateful to you and to all the leaders assembled here and to all of your colleagues in the government. General Chang, as you know, I first came to China in January of 1984 and have been here a number of times since then. But this, as has been noted, is my first trip as Secretary of Defense. As General Chang noted, we’ve just finished a morning of very good straightforward, productive positive meetings where I restated that the United States is committed to continuing to build the constructive and productive relationship with China. U.S.-China relationship is important for stability and security in the Asia Pacific and for achieving prosperity for both our nations in the 21st century. And as President Obama has said, the United States welcomes the rise of a stable, peaceful and prosperous China. One focus of our discussion to day was how we develop a new model of military-to-military relations, which I will address in greater detail in a speech that I’ll give this afternoon. I explained that the U.S. believes its approach should be to build a sustained and substantive dialogue to deepen practical cooperation in areas of common interests and to manage competition and manage differences through openness and communication. In each of these areas there is much work still to be done, but we’re making progress, strong progress. And, as General Chang noted, yesterday I very much appreciated the opportunity to tour China’s aircraft carrier and particularly to meet PLA personnel aboard the ship and have an opportunity to listen to these young sailors. And later today I’ll have the opportunity to speak to officers at the National Defense University. And, as General Chang noted, tomorrow I truly am looking forward to visiting with noncommissioned officers, which, I think we all appreciate, are the backbone of our militaries. Exchanges like this at every level of command are critical. They’re critical for building mutual understanding and also respect. Our vision is a future where our militaries can work closely together on a range of challenges, such as humanitarian assistance and disaster relief missions. However, to reach this objective we must be very candid about issues where we disagree, while also continuing to deepen our cooperation in areas where we do agree. And we have many common interests and we agree on many things. Regarding cybersecurity, I emphasized in our meetings this morning the need for both the United States and China to be more open with each other about our capabilities and our intentions in this critically important domain. Greater openness about cyber reduces the risks that misunderstanding and misperception could lead to miscalculation. More transparency will strengthen China-U.S. relations. As General Chang announced, we agreed today on several new ways to improve our military-to-military relationship. We will establish an army-to-army dialogue mechanism as an institutionalized mechanism within the overall framework of the U.S.-China military-to-military relationship. We agree to participate in a joint military medical cooperative activity. And this will build on the experiences gained at the 2014 Rim of the Pacific exercise, a U.S-hosted, multilateral naval exercise that China will participate in for the first time this summer. We’ll establish an Asia-Pacific security dialog to exchange views on a host of security issues. This dialog will build on the discussions General Chang and I had today on regional security issues, including North Korea, and the growing threat posed by its nuclear and missile programs. Continued instability on Northeast Asia is not in China’s interests, it’s not in the U.S. interests, it’s not in the region’s interests. And the U.S. is deeply concerned about the threat North Korea poses to our treaty allies and increasingly to our own homeland. The United States and China have a shared interest in achieving a verifiable, irreversible denuclearization of the Korean Peninsula. We also had a very good, direct, positive discussion about tensions in the East and South China Sea. I underscored that all parties should refrain from provocative actions and the use of intimidation, coercion or aggression to advance their claims. Such disputes must be resolved peacefully and in accordance with international law. I thanked General Chang and his leaders again for their generous invitation to visit China, and for their leadership and their partnership in working with the United States on many of these common interests, especially as we move forward on a new model for our military-to-military relationship. I look forward to more progress in the future because the China-U.S. relationship is essential, essential to peace and security in the 21st century. Let me also, as I end my comments and prepare with General Chang to take questions to acknowledge the U.S. ambassador to China, Max Baucus, who has been with me during my time here. And I appreciate that, but very much appreciate his leadership and the efforts that he is making here to continue to strengthen and deepen the China-U.S. relationship. MODERATOR: Thank you, Mr. Secretary. Now the floor is open for questions. Please first identify yourself before you raise your question. Q: I’m with the CRI, and my question is for General Chang. In recent days, certain complicated factors arise in the situation surrounding China, in particular Japan and the Philippines are stirring up troubles and violating China’s rights. General Chang, what do you think of this situation?